Rollin Southwell sent an update on the monument he’s spearheading for Carl Fisher, father of the Lincoln Highway. It is planned for the top of Johnson/Fisher Pass on UT 199 between Clover and Terra, Utah. Architect Steve Ehninger recently announced construction and the dedication dates. After a decade of planning, they are working on permits and approvals with hopes to be finalized by January 14, 2009. Construction could start April 9 and be completed by July 8. This includes a rock surround, asphalt paving, signage, and a beacon. Dedication is planned for August 12, 2009. Read more at a site about the Fisher Pass monument or Rollin’s blog for more info on Fisher. The Laramie Boomerang reports that the ashes of sculptor Robert Russin and his wife Adele have been interred at the monument he created in 1959 to honor Lincoln’s 150th birthday. Its location in eastern Wyoming marked the highest point on the transcontinental Lincoln Highway: 8,835 feet. In 1969, the monument was moved to the nearby Summit Rest Area (exit 323) when I-80 opened between Cheyenne and Laramie, and is now at the highest point along I-80: 8,640 feet. Joe Russin, one of the sculptor’s sons, said his father’s wish was to be laid to rest near the statute [sic]. The mighty statute was actually made in Mexico City and then brought, in pieces, to Wyoming…. ABOVE: Sculptor Robert Russin and assistants work on the bust of Abraham Lincoln. Courtesy Jim Kearns, Manager, University of Wyoming Media Relations. The crash of United Flight 93 on September 11 changed Somerset County, Pennsylvania, in many ways. The curious instantly began streaming to the site just off the Lincoln Highway/US 30, and entrepreneurs began servicing the visitors. The western of the two access roads from Route 30 crosses an original alignment of the Lincoln. A temporary memorial continues to draw visitors, but the National Park Service has a larger memorial planned. The corridor study concludes that the significant horizontal and vertical curvature of the roadway and the corresponding restrictions on sight distance and the heavy volume of truck traffic make traffic safety a paramount concern. This is especially true for a two-thirds-mile stretch east of the intersection with Old Lincoln Highway, the study reported. The study counts some 400 vehicles traveling to the site daily, and 900 on weekends. Once the new memorial opens, 400,000 are expected annually before tapering to 230,000. The entrance will be from a third, more easterly location, where Old Lincoln Highway meets Route 30. The intersection would be reconfigured, probably affecting the remaining buildings from the former Emerald Park tourist camp and tavern. For now, PennDOT is planning improvements east of Stoystown including replacing three bridges, and adding turning lanes at the intersection with Route 403. Locals responded to the flow of cars by creating yard sales, commemorative objects, and businesses to serve visitors. The photo above shows the Long Vu Motel just west of Reels Corners with a new name and sign promoting it’s connection to 9-11. Adele’s Diner across the road was in the news recently for similarly renaming to the Heritage Highway Restaurant, a nod to the range of history along the Lincoln Highway. 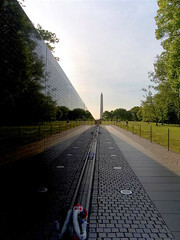 The black granite used in the Vietnam Veterans Memorial in Washington, D.C., was supplied by a family firm along the Lincoln Highway in Lynwood, Illinois, south of Chicago. According to a recent article in The Times of Munster, Indiana, Rogan Granite (21550 E Lincoln Hwy/US 30, about 1000 feet west of the Indiana border) supplied the granite that carries the names of 58,256 veterans who either died in Vietnam or are listed as prisoners of war or missing in action. Tom Rogan says, “It was a very proud moment for our company and our family…. It was an opportunity for us to show what the region could do in support of our veterans.” The company, with roots back to 1874, was known as Calumet Memorial until 1980, when Tom and brothers Jim and Mick expanded the business. The article recounts, “As part of the company’s headstone business, Rogan Granite supplied grave markers for veterans in several states. It was during a 1982 trip to Washington—to see which grave marker bids were successful—that Rogan learned of the plans for the memorial.” The bid required black granite because it could polish to a mirrorlike reflective surface and allow etched names to show up as white. The granite actully came from India, was cut and polished in Vermont, and etched in Tennesse, but the Rogan family coordinated the process of providing the 144 panels, each 44 inches wide each, that make up the two walls that are each 246 feet, 9 inches long. The memorial was dedicated on Veterans Day in 1982.